November 29 is World Digital Preservation Day. It's part of a growing awareness of the need to look after our stuff, which is both easier and harder than it was in a pre-digital age. Easier, because digital files can be copied as many times as you like without degrading, and usually for free. Harder, because our devices are only around for a year or so, their software is constantly changing and the services we use may not exist ten or twenty years from now. My interest in this is more to do with psychology than technology. I've called this blog Anchoring because, from my own experience, I believe that taking care of the documents, photographs and other precious items from your past and that of your family has a profound, beneficial effect in itself. It makes you more aware of where you came from and who you are - hence, I claim, it has an 'anchoring' effect. I'm writing a book about it and have started this new blog in order to make contact with anyone who thinks they know what I'm talking about. 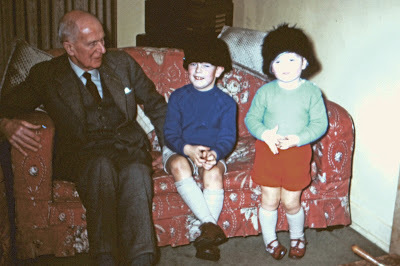 I'm sitting on the sofa (centre) with my grandfather and my brother in 1962. As I write this, 56 years later, I'm sitting on the same sofa. One person who might understand is Guy Garvey, the lead singer of the band Elbow. He presented a great documentary on Radio Four recently in which he talked about how he'd recorded his late dad reminiscing about his life over a decade. It was a moving story, but Garvey went further: he was on a mission to make us all use our phones and cameras to collect recordings of our loved ones - before it's too late. Three years ago, my mum died. I'm so glad that I'd spent some time interviewing her on camera, so at least I now have a few hours of video, where I can see and hear her. Of course, it doesn't put much of a dent in my bereavement, but is so much better than nothing. Family trees, old photos, letters, old films - they're all part of maintaining a sense of who you are, keeping you anchored in a world that is changing so fast that it's easy to lose your orientation. If you have thoughts about this, please do contact me as I'd love to discuss them. My name is Charles Miller. You can find out more about me from my Twitter account @chblm. If you have pulled your disparate family together by making a family tree, or reconnected with close family members by organising old photos, or got a better sense of your own past by looking back at your childhood diaries, I'd love to hear from you. Please email me through the contact form above. I'll be updating this blog with more about the subject and will post more on Twitter @Anchoringbook.